Ahhhhh….the first week of summer vacation! We’re all adjusting to the new schedule still, but I think we’re starting to settle in. I’m definitely liking the more relaxed mornings. 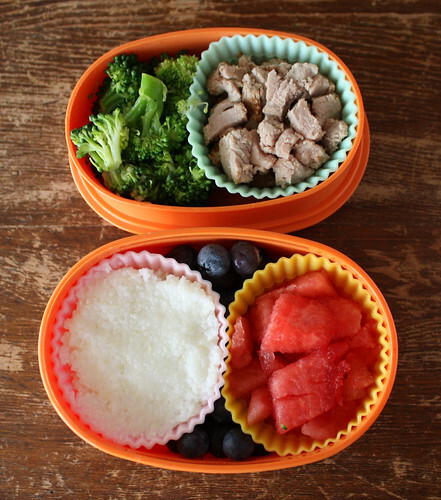 I was getting really sick of rushing around making lunches while the kids ate their breakfasts. It’s much nicer to sit down with them to eat and then make a quick snack for Wyatt while they play. I got two of these onigiri boxes at Ichiban Kan last week knowing that I’d be needing a couple smaller boxes for snacks for Wyatt at camp. 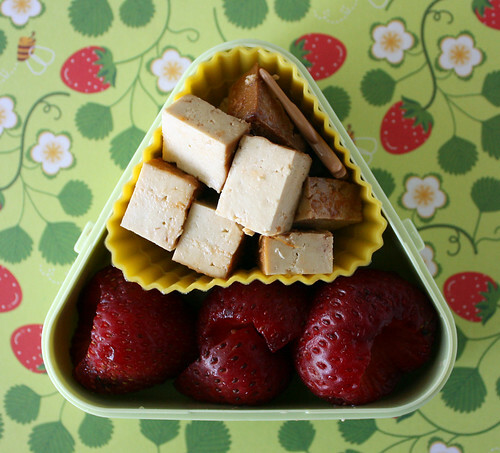 This one had some chunks of baked tofu and a couple of strawberries. On Tuesday, the toddler’s lunch had leftover broccoli, pork loin and grits from dinner on Monday. I also put in some blueberries and watermelon chunks. 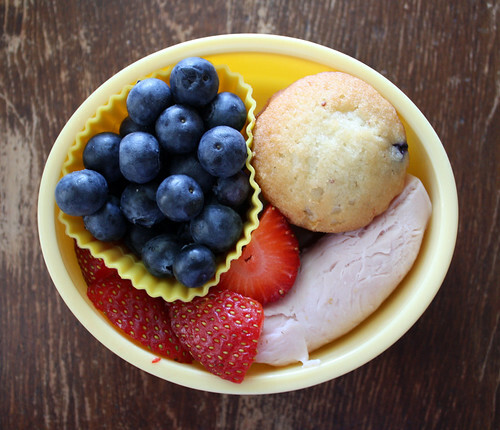 Wyatt’s snack box had blueberries too, along with a mini blueberry muffin, a slice of rolled-up turkey and some strawberry chunks. I’ve been trying to get a little protein in his snack each day because I’ve found it keeps his energy up a little better. 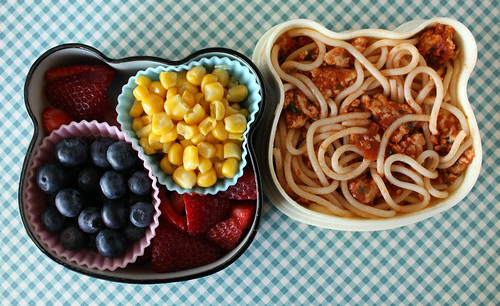 On Wednesday, Augie had corn, blueberries, lots of strawberries and leftover spaghetti with turkey and sauce packed in the panda bento box. Wyatt was sick and didn’t go to camp, so I didn’t make him a snack. 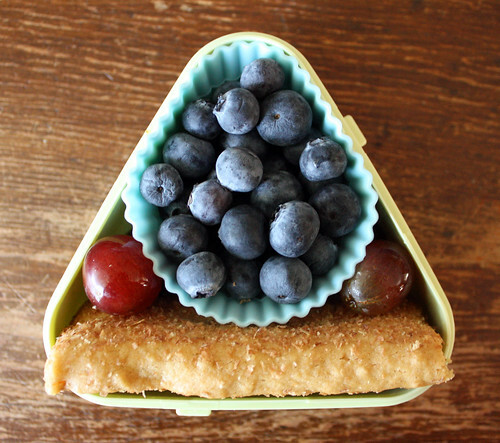 Thursday’s snack box had cheddar cheese stars, an apple cereal bar and a whole mess of blueberries. 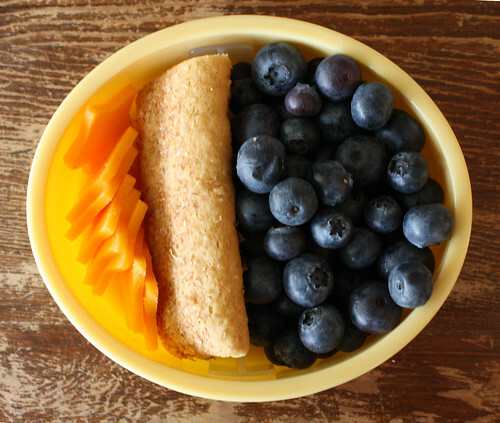 Today’s snack box had…blueberries! I guess that was a bit of a theme this week, huh? I bought one of those mongo boxes, that’s why. I also put in a cereal bar and then popped in a few grapes to fill the last bit of space.